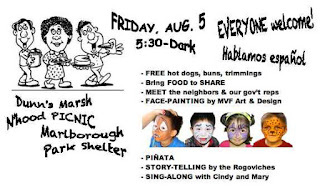 The first Friday in August - August 5, this year - is the customary day for the Dunn’s Marsh Neighborhood picnic, sponsored by the Dunn’s Marsh Neighborhood Association. It’s deliberately an informal affair, set up so that you can fill up on home-made food, meet and visit with your neighbors, and have fun with the kids. Festivities start at 5:30 pm and go on until dark. This year the DMNA is offering a potpourri of features of proven value - free hotdogs, potluck items brought by you, face-painting by MVF Art and Design (Veronica Figueroa, sister to our DMNA Council Member Yannette Cole), a piñata for strong kids and game adults to beat until it yields its candy, story-telling by experienced story-tellers Dale and Paul Rogovich, and a folk-song singalong led by neighbors Cindy Harrington and Mary Mullen. This year we are charging $1 per face painted, so be sure to bring as many dollars as kids. That’s as a mild fund-raiser for the DMNA. Could be, also, that someone will bring horseshoes to try out on our state of the art horseshoe pits. Feel free to bring any outdoor equipment you think your kids might enjoy - frisbees, hoola hoops, soccer balls, whatever. For your own comfort and to be certain you have seating, feel free to bring a lawn chair. We’ve also invited our elected officials to attend. So far we have positive responses from Madison Alder Maurice Cheeks who will be here with his family, and County Executive Joe Parisi. Editor’s NOTE #1 - This is a HUGE Dunn’s Marsh Neigborhood e-News. Don’t be intimidated. May I recommend a method to find what you want? Way #1 - Preview the major topics and titles of the articles in the list below. Way #2 (my favorite) - Just scroll down looking at titles and reading articles as they catch your fancy. Why so huge? Well, it’s been 4 months since a full-length e-News, and that means a lot of water has gone over the dam. No Calendar this month, but many - not all - of the articles announcing dates or deadlines are in the first 2 topics. NOTE #2 - Articles and photos are by Mary Mullen unless noted otherwise. 5 - Are you ready to vote in 2016? Voter ID is now required. 13 - FYI - Nextdoor Dunn's Marsh and the Dunn's Marsh Neighborhood Association, what’s the difference? 18 - Do You Help An Older Friend or Family Member? 27 -What Were Those Plants That Are Hiding the Dunn’s Marsh Sign? 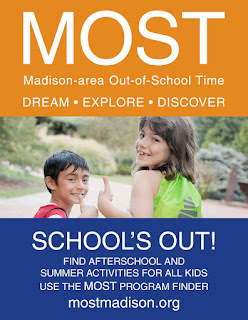 Check out the attachment and then start using the MOST, the Madison-area Out-of-School Time program finder. The 20-foot-wide pedestrian tunnel under Verona Road (US 18/151), south of the Beltline, will be CLOSED starting Monday (August 1) for three (3) weeks. Share the Facebook post and picture <http://lists.wi.gov/t/1200336/2644525/8378/5/ <http://lists.wi.gov/t/1200336/2644525/8378/5/> > with others who travel this area. Pedestrians and bicyclists must use other sidewalks and crosswalks. Crews will install the new sky light in median area of Verona Road to ensure an open environment for those using the underpass. The area is well-lit (day and night) and maintained throughout the year, as well as routinely monitored by the Madison Police, including cameras connected to the Madison Police Department. Help us spread the word about this temporary closure, and SHARE this post and picture with others. On Thursday (August 4), maintenance crews will complete a routine inspection of the Verona Road (US 18/151) bridges over the frontage road system and roundabout, just south of the Atticus Way intersection near the Allied Drive neighborhood. From 10 a.m. to 2 p.m. Thursday, the roundabout portion of the frontage road system will be CLOSED to all traffic and motorists will be required to use alternate local routes. Madison Metro buses and emergency vehicles will be permitted under Verona Road. Nearby sidewalks will remain open for pedestrians and bicyclists, and access will be maintained to area businesses and neighborhoods. No impacts to Verona Road (US 18/151) traffic, only the frontage roads. The 2016 fall partisan primary is Tuesday, August 9, 7 am-8 pm. This election will narrow the field to one candidate per party. 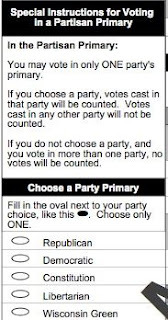 You may only vote within one political party. Read all the “Special Instructions for Voting in a Partisan Primary.” Following them will guarantee that your votes count. You still have to mark your choice for each candidate you want. The voting location for neighborhood voters in Madison is the Revival Ridge Apartments community room, 2313 Allied Drive. Fitchburg voters from the neighborhood vote at Fitchburg Fire Station #2, 5415 King James Way, near Verona Road and PD, west of Verona Road. The ballot will include US Senate and US Congress District 2; State senators and assembly representatives; Dane County District Attorney, Clerk, Treasurer, and Register of Deeds. In-person absentee voting has already started continues through August 5, Monday-Friday, 8 am-7 pm at the Clerk’s Office in the City-County Building, Dr. Martin Luther King, Jr, Blvd. You may request an absentee ballot by mail, fax, or e-mail as long as the request arrives in the clerk’s office no later than 5 pm on Thursday, August 4. The presidential election will be held on Tuesday, November 8. In the election on April 5th, 123 voters in the city of Madison were given provisional ballots because they did not have an acceptable voter photo ID on Election Day. Only 41 of those voters provided a photo ID in time for their votes to be counted. Don’t let this happen to you. Be sure you are ready to vote in the upcoming elections on August 9 and November 8, 2016. If your address has changed since you last voted, you will need to register to vote at your new address. You can register at your municipal clerk's office, with a Special Registration Deputy, or, if a Madison resident, at any Madison Public Library. Beginning twenty days prior to an election you can only register at the clerk's office or at the polls on Election Day. Registering early will save time on Election Day. You will need to show proof of residence whenever you register. Voters are now required to show a photo ID when voting. You can use a US Passport, a Wisconsin driver license (DL), or a Wisconsin state ID card with expiration dates after November 4, 2014. You can also use a Veteran Affairs card that is unexpired or has no expiration date. If there is an address on your photo ID, it can be unexpired or expired after the date of the most recent general election (currently, the November 4, 2014 election). Don’t let recent lawsuit information about being able to vote without ID. That doesn’t apply to the August 9 election. If you don’t have all the proof you need, DMV will help verify your information. For full details go to http://wisconsindot.gov/Pages/dmv/license-drvs/how-to-apply/id-card.aspx . requirement. For more information see http://bringit.wisconsin.gov/are-there-exceptions-new-law . Nursing home residents can be visited by a representative of their local clerk’s office. Check with care facility staff or your municipal clerk. Nursing home residents do not need a voter photo ID, as staff will vouch for their identity. Fall elections (Partisan Primary and General Election) are August 9 and November 8, 2016. Talk to your friends and neighbors. Make sure every eligible Wisconsin voter has the documentation needed to vote! For more information about voting in Madison, go to the clerk's office web site at www.cityofmadison.com/election <http://www.cityofmadison.com/election> . For help in getting a free state ID for voting or for a free ride with Union Cab to the DMV, call the Voter ID hotline: 608-729-7720. It’s old news, especially since both the Rupublican and Democratic presidential candidates have been officially annointed at their conventions, but maybe you’d still like to take a peak at neighborhood preferences as expressed in the April 5 primary. 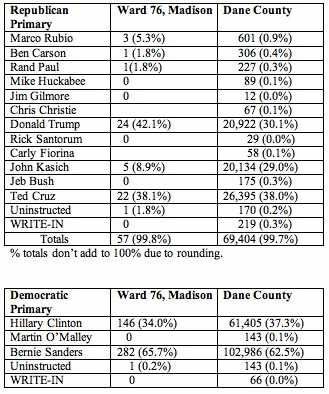 The charts below show how voters in the Madison part of our neighborhood - Ward 76 - voted in the April 5 presidential primaries compared to voters in all of Dane County. Unfortunately, because Fitchburg voters don’t have their own polls in the neighborhood, those statistics aren’t available. In the crowded Republican primary Ted Cruz was the county-wide winner with 38% of the Republican vote. Donald Trump and John Kasich nearly tied at 30.1% and 29% respectively. Republican Ward 76 voters preferred Donald Trump, giving him 42.1% of the vote compared to Cruz at 38.1% and Kasich at 8.9%. In the Democratic primary Bernie Sanders was the front-runner both in Dane County and among Madison voters in the neighborhood although our neighborhood voters preferred Bernie at a higher percentage. Bernie got 65.7% of Ward 76 voters whereas he got 62.5% county-wide. County-wide, 234,147 votes were cast in the two primaries with Democrats outnumbering Republic voters by 95,339 voters. 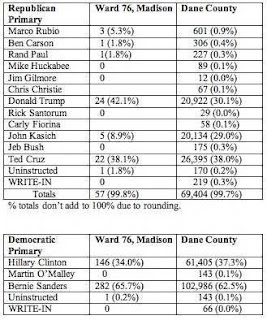 In other words 70.3% of the Dane County voters cast votes for Democratic presidential candidates. Hearings were held in May on proposed route changes for buses 18 and 19 that serve our neighborhood. Links to the routes include maps that show both the current and planned changes. Route 18 <http://www.cityofmadison.com/metro/publichearing/18.cfm> (via Midvale) Shifts service from Britta Pkwy to reconstructed W. Beltline Frontage Rd. Route 19 <http://www.cityofmadison.com/metro/publichearing/19.cfm> Service shifts from Verona Rd. to Verona Frontage Rd. to serve Chalet Gardens all day. AM trips travel counterclockwise and PM trips travel clockwise, with the exception of the Allied Dr. loop. The Dunn’s Marsh Book & Movie Club has dates and books selected through January 2017. The club generally meets at 1905 Danbury Street with hosts Thea and John Bach, starting at 6:00 p.m. with social time, 6:15 potluck meal, and discussion from 6:30-7:30, and then viewing of the movie if there is one. Contact Thea Bach to confirm the location of each scheduled discussion and to ask any other questions, 274-7730, or bachtown2@live.org It’s best to phone. The Allied Community Co-op’s Grocery Buying Club is meeting the first and third Tuesday of every month at 5:45 pm, at Joining Forces for Families (JFF), as it gears up to actual operation. The meeting starts at 5:45 pm. JFF is on Allied Drive in the second apartment building north of Jenewein Drive and next to the Madison School District satellite building on the corner of Jenewein and Allied. The system has recently been tested out with a limited choice of items. The next meeting is August 2. There is support. You don’t have to endure this alone. This group was created with you and others like yourself in mind. We are your peers. Please allow us the opportunity to support you. Please Contact: Shonita, 608-509-1645, with questions. It’s a standing date, the meeting of the Dunn’s Marsh Neighborhood Council on the second Thursday of each month. The next meeting is Thursday, August 11, 6 pm, at Praire UU Society, 2010 Whenona Drive. Enter the building on the Crawford Drive side of the corner. The DMNA Neighborhood Council keeps abreast of concerns and events in and related to the neighborhood and plans social events just for fun and to help neighbors get to know each other. It helps our neighborhood stay strong by being the monthly meeting you can go to with concerns and ideas. It’s also a point of contact between the neighborhood and City of Madison and City of Fitchburg government. When you join the e-mail list, the DMNA (Dunn’s Marsh Neighborhoood Association) sends the Dunn’s Marsh Neighborhood e-News to your e-mail in-box. The neighborhood association also has a Facebook page to keep you informed on an almost daily basis. Look up Dunn’s Marsh Neighborhood Association. You are on the correct page if you see the fabulous mural with a marsh scene and the waterfowl symbol for the neighborhood. For much more information about the neighborhood and the DMNA check out the website www.dunnsmarsh.org <http://www.dunnsmarsh.org> It has a calendar so you can see at a glance what’s coming up. The website is under revision right now, so be patient if you can only access the home page when you check it out. The complete website should be available soon. Thanks to our DMNA Treasurer Yannette Cole who has learned the ins and outs of website creation over the past few months, our website has a completely new look. Council was elected 10/15/15 and serves until Sept. or Oct. 2016. Please feel free to contact any of these Council members with concerns or ideas about the neighborhood. We have room for 2 more Council members. Contact President Mary Mullen if you want to volunteer to be on the Council. It’s come to my attention more than once that some people believe they have joined the Dunn’s Marsh Neighborhood Association (DMNA) when they signed up for Nextdoor Dunn’s Marsh or Nextdoor Dunn’s Marsh - Belmar. There’s a major difference. “Nextdoor Dunn’s Marsh” and “Nextdoor Dunn’s Marsh - Belmar” are simply listserves that allow neighbors to post information and see other members’ posts. • to promote fellowship among neighbors. The DMNA, founded in 1973 and located in both Madison and Fitchburg, WI, is a very active group. We sponsor annual social events as well as monthly Council meetings. Over the years our members and neighbors have shaped the neighborhood, witness the 19-acre Marlborough Park with its large community garden and paved bike paths; public land around Dunn’s Marsh; bike lanes on the frontage roads, and multi-use paved paths; and, more recently, the Dunn’s Marsh Neighborhood sign, mosaics in the Community Garden, and the spectacular murals on the frontage roads. 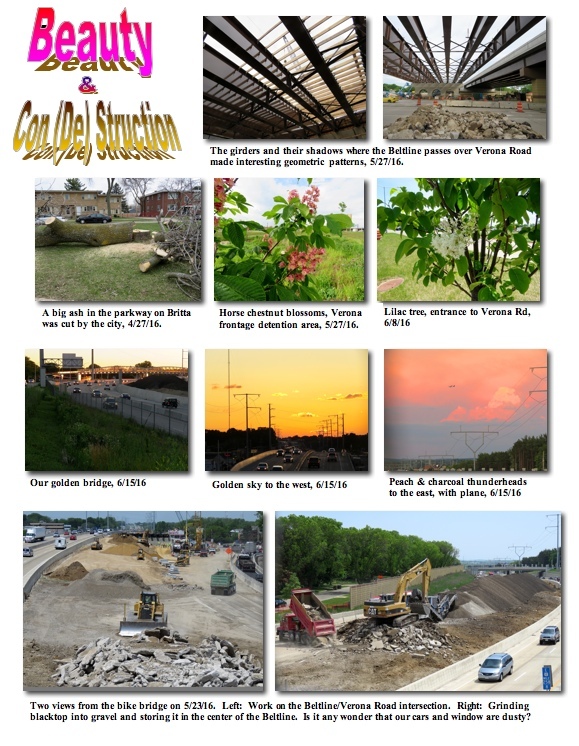 The DMNA publishes the Dunn’s Marsh Neighborhood e-News and an occasional hard-copy DMN News. We have a Facebook page as well as a website, www.dunnsmarsh.org <http://www.dunnsmarsh.org> (currently only partially on-line while being totally revised). DMNA members elect a board of representatives - the Dunn’s Marsh Neighborhood Council - from all parts of the neighborhood in September or October to carry out these purposes. Thursday, August 4, 1 – 3 pm – Oakwood Prairie Ridge Chapel,5565 Tancho Drive, Madison. Tuesday, August 23, 1 – 3 pm – Oakwood University Woods Nakoma Room,6205 Mineral Point Road. Join many other Madisonians for a FREE celebration every Friday in August on the Monona Terrace Rooftop. The gates open at 4 pm, bars at 4:30 pm and the first band starts at 5:30. Three bands are featured each evening. The dance ends at 9:30 pm. Here’s the schedule. If inclement weather concerts will be moved inside; the August 26 concert will be moved to the Alliant Energy Center. 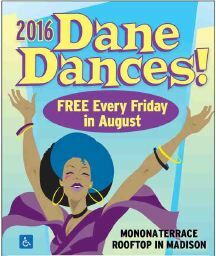 Call 608.261.4000 for concert location or visit DaneDances.org. Nip Pen is a gardener at Marlborough Garden in plots B-14, C-14, and D-14. He suffers from Alzheimers and may be lost if he is on the street wandering around. He speaks Khmer, so he won’t be able to tell you that he is lost or where he lives. However, he does wear a chain with a tag that has his daughter Sarin’s telephone number, (608) 658-6347, and his address on Allied Drive. His son-in-law’s number is (608) 395-5157. Help Nip Pen if you see him wandering on the streets east or north of Marlborough Park. These streets would include Whenona Drive, Milford Road, Crawford Drive, or any others parallel to these streets. El jardinero Nip Pen, jardines B-14, C-14, D-14 tiene Alzheimer. Si parece que necesita ayuda favor de llamar a su hija Sarin Pen al 608-658-6347 o su yerno Marcos al 608-395-5157. El tiene una placa en su cadena con el numero de teléfono de su hija y su dirección. Do you regularly help a friend or family member age 65 or older, who might have difficulty running errands like shopping or banking, or maintaining their home, or managing their health? The University of Wisconsin–Madison School of Nursing is developing an online tool to provide information and guidance to people who are helping older adults. We’re asking people who help older adults to do an online activity grouping topics related to caregiving. By better understanding how these helpers view and organize information, we can make our tool more useful and easy to navigate. If you have any questions, please contact the UW–Madison School of Nursing at care@son.wisc.edu or 608-265-4330. Feel free to share this message with others who might be interested. Call today! 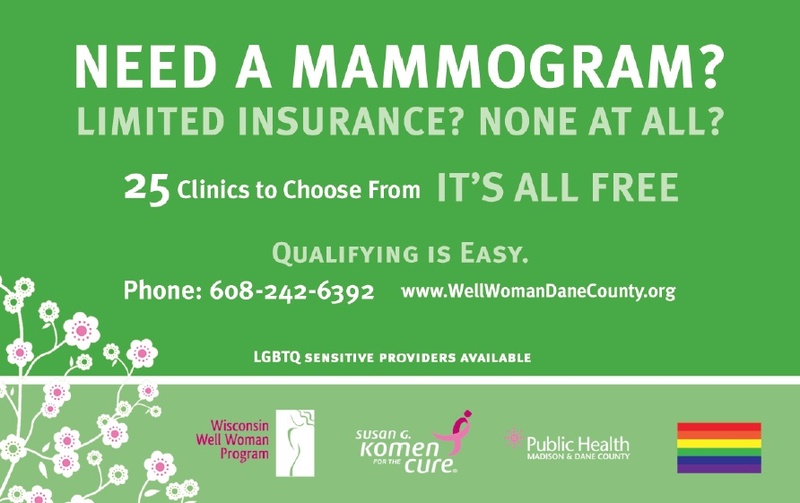 (608) 242-6385. Over 25 clinics to choose from. We have 5 Little Free Libraries (LFL) in our neighborhood. They are meant to provide free books for young and old, preferably on the take-a-book / add-a-book basis. However, the LFL on Lumley at Danbury has had its windows knocked out twice and its books thrown around and torn up at least 5 times. Sometimes the materials have been strewn around the LFL, sometimes in other people’s driveways, and sometimes elsewhere in the the neighborhood. The vandalism has continued, including on this July 3. Therefore, we are looking for a new home for that library. If you think you would like to host the LFL in your front yard, let us know (See masthead for numbers and e-mails.) We think the vandalism would stop if the location were changed. The other 4 Little Free Libraries - in order of their installation - are (1) in front of Prairie Unitarian Universalist Society, 2010 Whenona Drive, (2) at the Marlborough Park Community Garden under a tree near the sandbox, (3) at the Boys and Girls Club, 4619 Jenewein Drive, and (4) on Red Arrow Trail at Head Start. The Prairie LFL was vandalized twice early in its life, but for the past 3 years it has been vandalism-free. The community garden LFL was broken when it temporarily sat on a picnic table or the boulders near the shed last year, but nothing has happened to it again since neighbor Kent Seeker repaired it and put it on a permanent post early this summer. The libraries on Whenona and Lumley were installed in 2012. The ones at the Boys and Girls Club and at Head Start were put up this year. Two neighborhood men who do not even have plots in the Marlborough Community Garden have been helping make the garden a better place. They are Kent Seeker and Phillip Meyers. Just recently, Kent repaired the garden's Little Free Library and installed it next to the bench at the corner of the larger no-till garden area. Kent had also masterminded the Marlborough Community Garden mosaic sign and supervised its installation back in the late summer of 2014. Phillip Meyers, our other helper, also worked on installing the mosaic sign in 2014, but, in addition, for the past 2 years he has been the garden’s wheelbarrow repairman. He has inflated or fixed flat tires, put on new tires, and repaired wobbly wheelbarrows in other ways. Kudos to these neighborhood helpers, who get nothing for their time but satisfaction of a job well done and thanks for their work. Unfortunately for us, Phillip will soon be moving from the neighborhood in September . A reasonably cool sunny day, shade available for all, continuous well-performed music from 4 pm-8 pm, snacks available on site, and a Maypole dance toward dusk were the welcoming features of Make Music Madison, held at Prairie UU Society and co-sponsored by the Dunn’s Marsh Neighborhood Association on June 21. The penultimate highlight of the day was definitely the Maypole. While “Grandpa Squeezit” - Mike Briggs - played accordion, 14 people at a time, from young kids to retirees, circled the pole, braiding or unbraiding the ribbons attached to the crown. The pole itself was fashioned from a cedar tree knocked down by a motorist during the winter from a nearby yard. It had only been used once before on the grounds. Audience numbers ranged from a low of 14 at the very beginning to a high of 41 at about 5:30 pm. Average attendance was around 30. This was the 4th year of the city-wide free music concerts and the 4th year that Prairie and the DMNA teamed up to provide live music to the neighborhood. Quite a few of the acts had connections to the church. Neighborhood residents participated in two: one of the members of Dark of the Moon Contra-Band was Mary Mullen; former resident Jesse Cole entertained with his original raps. Volunteers from both organizations made it all happen, from arranging the acts, distributing flyers, putting up signs, setting up the chairs and speaker system, running the sound, passing the bucket, selling snacks, and putting everything away again. From the DMNA we have 10 people to thank for distributing flyers: Thea Bach, Brooke Norsted, Pam Flinn, Sharon Grant, Faith Cholvin, Julie Lyne, Kent Seeker, Elvice McAlpine, David Martin, Kim Zinske, and Mary Mullen. It was Elvice McAlpine, Mary Mullen, and Prairie member Dan Proud who put up the signs, while Mary Mullen and Patty Stockdale took them down. DMNA volunteers on the day of the event were Elvice McAlpine, Yannette Cole, Faith Cholvin, Patty Stockdale, and Mary Mullen. Prairie members also helped: Carl Wacker, Al Nettleton, Bill Parmenter, Penny Eiler, Cheryl Robinson, Deesa Pence, Gary & Pam Gates, and others. The bucket was passed during each performance, and the audience gave generously, about $123 for the 9 acts altogether. Performer Jesse Cole donated his $16.30 to the DMNA, and another perfomer donated her $6.43 to the church. The DMNA provided the bottled drinks and salty snacks, bringing in about $25 for the Association. Sylvia Engel, a woman who loved nature, who served on the Dunn’s Marsh Neighborhood Council in the 1980s, and was very much involved in UW - Arboretum, died on April 8. At first Sylvia lived on Allied Drive, but most of her years in the neighborhood were spent on Danbury Street with her two daughters and her partner Sara Killian. Sara Killian is the artist who drew the illustration on the front of the Dunn’s Marsh Neighborhood history book, In Our Own Words: The Best of the Dunn’s Marsh News. Here is a portion of Sylvia’s obituary. …Sylvia raised two daughters, earned a bachelor's degree in Anthropology from the UW Madison, and spent a great deal of time exploring nature and volunteering to support preservation and enjoyment of natural areas in Wisconsin…. Sylvia was a self-taught naturalist and enjoyed teaching others about plants and animals. She was a dedicated volunteer, and worked countless hours sharing her knowledge and skills to help preserve the natural areas that she loved around Madison and Wisconsin. At the Arboretum, she was a team leader for weekend work parties, helped monitor trillium populations, was a trail steward, and helped in the bookstore. She was also a volunteer with Dane County Parks, helping with Prairie restoration projects and invasive species management. Three times a year she would head out at night to count frog calls for the Department of Natural Resources Wisconsin Frog and Toad Survey. She also spent two summers as a volunteer in the bookstore on Isle Royale, living on the remote island for several weeks (She was in her fifties and was one of the oldest volunteers there). 'Til I can rest in it and become soft and silent too. American Councils of International Education is currently recruiting host families for the YEAR program, an exchange program sponsored by the U.S. Embassy in Moscow. This fall, two Russian students between the ages of 19 and 21 will be coming to Madison to spend the 2016-17 academic year studying at Madison College. Elizaveta and Veronika will be arriving on a competitive scholarship as a part of the first ever delegation of the YEAR Program. Designed to support person-to-person diplomacy and foster greater cultural understanding between the U.S. and Russia at a time of growing tension, the YEAR program (Year of Exchange in America for Russians) will provide full university scholarships to approximately 75 Russian students who have outstanding academic records, excellent English, and a strong interest in learning about U.S. culture. Two of these young people will be living with host families in the Madison community, and are excited about the opportunity to share their culture while learning about the American lifestyle. During their year, they will become members of local families while forming friendships at Madison College and in the general Madison community. They are involved leaders in their home communities, and are eager to explore new leadership roles during their time in the U.S.
Veronika is pursuing a degree in computer science and plans to work in IT someday. Her English is superb and has been honed through several years of study, including competing in the English Language Olympiads in her school and city. Elizaveta is studying English language & literature with a minor in translation studies, though her true passion is fashion. She hopes to one day open up her own fashion design business and to write a fashion blog. Families and individuals as diverse as America itself can host YEAR students. We ask only that they be open to new cultural perspectives and ready to help a young student adapt to life abroad while providing a comfortable bed, a quiet place to study, daily meals, and friendly conversation. I have attached ​​​​a flier with more details about the program as well as the host family application. Anyone who is interested in learning more can respond to this e-mail by asking for the Host Family application. Also contact the author of this article, Julianna Stohs at juliannastohs@gmail.com or 608-515-0547 <tel:608-515-0547> . Need some sewing work done? You should now be able to take care of your tailor needs right in the neighborhood. A business space that’s been open for awhile got a new tenant in June, a tailoring business. It’s the space on the corner of Danbury and the Beltline frontage road where friends and neighbors worked on the tile mosaics for months during late 2014/early 2015. Chris Ogden and his wife own the building and have their businesses there. Chris made the announcement on April 22. “Our new tenant is Alpine Tailor, formerly on Monroe Street, for 20 years. They will be moving in during the month of June. The owner is Jackie Brown. They do alterations, hemming, sewing on buttons, and more. I have used their services for years and can vouch for their careful, prompt work. 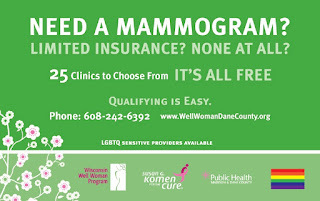 Their number is 608 233-4112, and hours will be Tuesday, Wednesday, and Thursday, 11 a.m.-6 p.m., Saturday,11 a.m.-3 p.m. The Dunn’s Marsh Neighborhood is rich in parks and natural areas, not to speak of the 1200-acre UW Arboretum on our eastern border. It is about to become even richer. 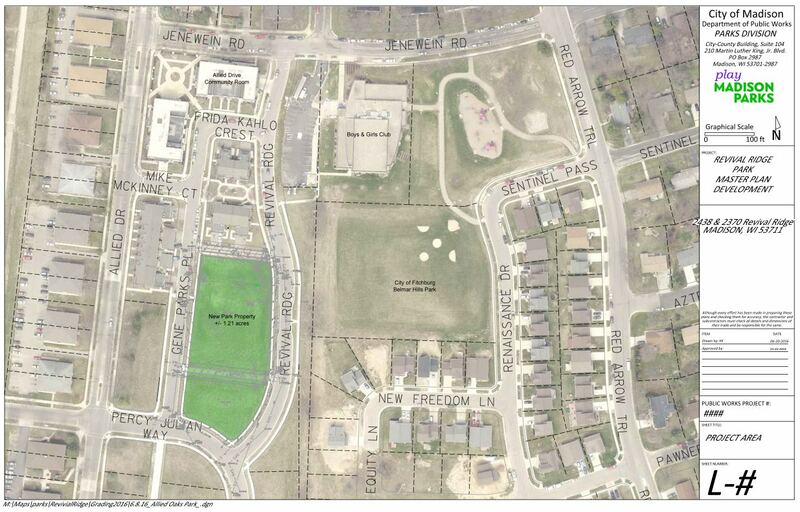 The City of Madison closed on the two lots that will become the new Revival Ridge Park in the Allied Drive area of the Dunn’s Marsh neighborhood! The next step in creating a park at the property will be to develop a master plan - and we need your help to do it! This summer, Parks staff has attended several neighborhood-related events and hosting sessions with the youth and community at-large to get input on the new park's design. 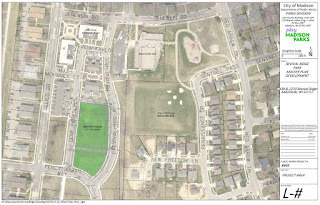 The next planning session will take place on Wednesday, August 3 on the park site. Food trucks will be available from 3:30-7 pm and the planning activity is scheduled from 6-8 pm. Then, prepare to be entertained with a movie at 8:30 pm. Following the public input process this summer, Parks Construction staff will begin the rough grading of the site to prepare it for construction in fall 2016. The contract to construct the park is anticipated to be bid in winter 2017, with construction starting in spring 2017! There’s a new building spree underway in the western part of the neighborhood. You can see single family houses going up on lower Allied Drive, and earthmoving equipment is roaring and smoking away in the Fitchburg area north of Crescent Road in the Renaissance development. Many of the homes are being put up by Habitat for Humanity with sweat equity help being provided by the soon-to-be owners of the Habitat homes. The photos associated with this article were taken on July 20. 27 -What Were Those Plants That Were Hiding the Dunn’s Marsh Sign? If you drove up Seminole to the neighborhood early in June, you may have noticed that a host of flowers with white blooms had grown so tall that they hid most of the words on the Dunn’s Marsh Neighborhood sign. Fortunately, the logo still shows. The white-blossoming plants were Canada anemones, a native wildflower. They and the wild strawberries were the most prominent plants at that time. Now, fortunately they have died down, and there’s a showy bright orange butterfly weed in bloom. It’s a type of milkweed. Why are flowers hiding the sign now when they did not when the sign was on the frontage road? Inadvertently, when the sign was moved, it was placed a foot or so deeper in the ground than previously. Can you believe it? The apple trees planted in the Marlborough Garden leased area are already producing! The trees are a bit over head high. The branches - really just twigs - that each hold one apple are barely strong enough to support the load. These apple trees and serviceberry trees are part of an orchard planted last spring. They join the plum trees planted 6 or 7 years ago that produced heavily last year. This year just some of the plum trees are showing a crop. 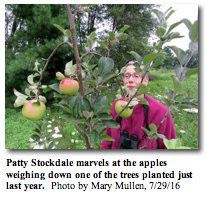 The idea of orchards on public land is to provide fruit for free to the public. Where were you when that gully-washer poured down 4 ½ inches or more of rain and blew down tree branches all over the neighborhood on Thursday, July 21? About 30 of us were up by the Marlborough Community Garden shed where we had planned to meet for a workshop at 5:30 pm. But we saw that threatening black cloud fast approaching from the north and quickly decided it would be best to change our location to an alternative space. Fortunately, we had reserved Prairie UU Society, a block down from the park. Lucky we did, because shortly after we arrived, the heavy rain and driving wind were nearly blowing the windows out of the church. Then about 7 pm or so, and all the lights went out. We sat in stunned silence for a bit. Then all the cell phones came out, flashlight function on, and we continued learning about how to conserve water in the garden and got some tips on communicating across language barriers. Well, did we really have a choice of leaving? Not really. What person in their right mind would go outside in such a raging storm? Some people in the neighborhood, including Prairie UU, were without electricity until the middle of Friday afternoon. The next day we saw what the storm had done. A big maple dropped at Lumley and Whenona taking wires with it. This was the second windstorm of July. One one the night of July 5-6 felled trees and branches in Marlborough Park, the park between Britta Drive and Parkway, and many other places in Madison. 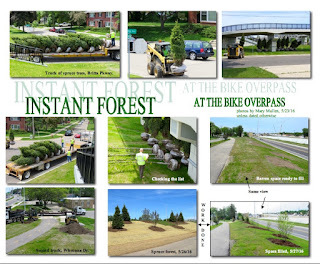 “Instant forest,” I say to the man coming up the path to the ped/bike bridge. I’ve been admiring the newly planted landscaping, taking photos of the name tags and the trees. The man has a very different opinion. He complains that the trees and shrubs are planted one in front of another or too close. “That’s stupid,” he says, and “Must be decided by someone sitting at a desk.” That’s a way to take the wind out of my sails. 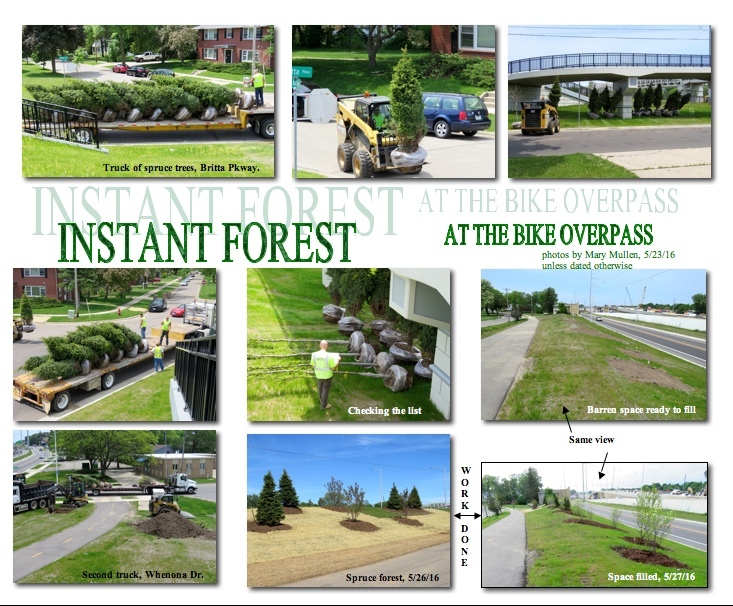 The many times I’ve passed by the plantings, especially those of the spruces close to Niemann Place and adjacent to Britta Parkway, I’ve been delighted to see this instant forest that was planted during the week of May 20. I’ve got no complaints at all. Among the deciduous trees planted are Northern Catalpa, Donald Wyman Crabapple, Purple Prince Crabapple, Jefferson Elm, Cleveland Select Pear, Exclamation Planetree and Sienna Glen Maple. Shrubs planted are the Winter King Hawthorn and Forest Rouge Blackhaw Viburnum. Evergreens on the berm are Black Hills Spruce and Canaert Juniper. The City of Fitchburg is updating its Bicycle and Pedstrian Plan to maintain and improve options for biking and walking in Fitchburg. Fitchburg residents and other interested parties are invited to use the website www.fitchburgbikepedplan.org <http://www.fitchburgbikepedplan.org> to provide your ideas and guidance, learn more about the plan, and to review project documents and products. In fall 2013, Emerald Ash Borer was confirmed in the City of Madison. The Forestry Section began treating trees in spring 2014. Currently there is no money in the city budget to treat park ash trees and we recognize that citizens may want to help in these efforts. The Adopt-a-Park Tree program’s goal is to provide a way for residents to help preserve the ash tree population in Madison’s parks. The program allows residents to select specific ash trees that they are interested in saving by working with City officials and contractors <http://www.cityofmadison.com/parks/services/forestry/pests/EAB/AdoptaParkTree.cfm#contractors> that are licensed by the City of Madison to chemically treat ash trees. If you are interested in adopting an ash tree please submit the request form. What trees are or are not eligible? The decision to treat an ash tree(s) is strictly that of the Madison Parks Division. The Adopt-a-Park Tree Program applies to park property only, not street terrace trees. Treatments are allowed for ash trees that are in good condition and are greater than 10 inches in diameter (at 4-1/2 feet). An approved adoption is NOT in perpetuity. A chemical treatment only lasts for 1 or 2 years. The cost of the treatment is worked out strictly through the resident and the licensed contractor. The resident is responsible for renewing a request for adoption each time a treatment is needed. The only allowable method of treatment is direct injection into the tree trunk. Please note that applications may be sent in anytime, however, staff cannot review the actual trees requested for adoption until spring and the trees begin to leaf out. When ash trees are dormant for the winter it is difficult to determine the tree’s condition. Sometimes, an ash tree is not known to be infested until late June or early July. Ash trees can only be treated when trees have fully leafed out. Staff will begin reviewing applications on May 15. EC3 Environmental Consulting Group, Inc.
Everybody, it seems, has an opinion on dandelions. They’re the bane of our existence. They are a child’s delight. Shame on anyone who lets one go to seed. Better dandelions than the poisons to kill them. In May the list-serve NextDoor Dunn’s Marsh - NOT related to the Dunn’s Marsh Neighborhood Association - was the battleground of the dandelions. A veritable blizzard of posts followed, 33 in all, all in 2 days. Since the original commentator copied his post to Arbor Hills and 10 nearby neighborhoods, many people had a chance to respond. Neighbors from Arbor Hills, Indian Springs, Dunn’s Marsh, and Dunn’s Marsh-Belmar got into the act. While 15 people thanked him, many took exception to what they characterized as shaming, intolerance, pettiness, or lack of concern for the environment. Here’s a sampling of remarks from people in our Dunn’s Marsh Neighborhood. “I love dandelion flowers. In any parts of the world considered a special medical plant. They are a lovely yellow color and make my kids smile when the see them since it's a flower they are allowed to pick, feel, and touch! Thank you to everyone whose mom smilies at them for bringing them a handful of danilions instead of yelling get those ant covered weeds out of my house! Thank you for the flowers, to those who do not spray toxins on them to harm wildlife, kids and pets(the grass near the road belongs to the city look it up)the only bloom a short period of time in the summer! “That's the opinion of about 95-99% of people who live here." So if 95-99% of people who live there have that opinion, then 95-99% of the houses and apartment buildings there have groomed and well-tended suburban lawns? Based on the lawns in our neighborhood, we seem to have a different range of opinion on the matter. #FirstWorldProblems I'm thankful that those of you concerned with your neighbors yards don't have more serious things to worry about - like chronic illness in you or your children, having to make decisions about the healthcare of your parents, grieving a loss, etc. If one's neighbors are not "living to standards" & have too much indigenous & volunteer plants in their yards, perhaps one ought to move to a neighborhood with a association that specifies these requirements. We will keep providing a nurturing environment for bees & wildlife, and remain grateful that our neighborhood is relaxed on such matters. I also couldn't help but think of people who have really serious issues to face: hunger; money for housing and health problems; need for a well-paying job; family members in trouble, and on and on. I have hesitated to reply, but I'm shocked by this! I thought it was a joke at first. I guess it depends on where your priorities lie. For us, we'd rather spend our money elsewhere (tithing, kids savings, various donations, endless house projects, the list goes on). I'm sad for anyone who puts that much emphasis on outward appearance. I think we can all rest easy for awhile, most dandelions are long since past flowering or going to seed. The fox was seen on May 26. An earlier sighting came from April 18 from a different resident of Arbor Hills. "This morning we had an interesting time watching a young fox trying for an orange cat and then a young turkey walked in to the area too! After trying for the cat several times, fox got his walking papers and the turkey flew away. (I would have stepped in if the cat was in trouble!)" The trees, the sky, the progressing road construction project - beauty can be found free of charge. before they become a road, sunset scenes from the Beltline frontage road, and the face of construction of the north lanes of the Beltline. 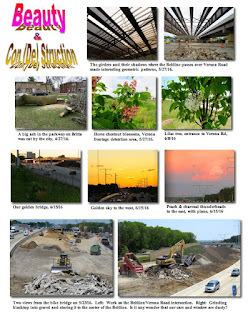 The attachment shows old trees at the end of their life, new blossoming trees, the patterns of the giarders before they became a road, sunset scenes from the Beltline frontage road, and the face of construction of the north lanes of the Beltline. Take a look. You can be amazed! A new neighborhood association is forming on the other side of the Beltline. It will include residences north of the Beltline, east of Midvale, north of the Southwest Commuter Bike Path, and will be bounded on the east by the Arboretum and the Nakoma Golf Course. Look at the attachment to see a visual of what’s included. 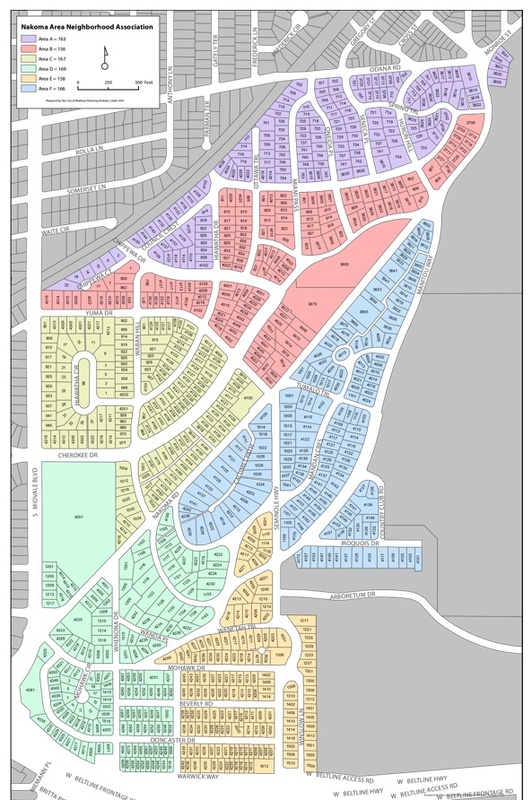 A little confusing for us, its name will include names of subdivisions identical to two of ours. Its name will be Crawford-Marlborough-Nakoma Neighborhood Association. Our DMNA also includes Crawford and Marlborough sections, although our name, Dunn’s Marsh Neighborhood Association, is very different. A handout given to attendees at their Make Music Madison event in Nakoma Park gave this information about the soon-to-be launched association. Why are we forming a neighborhood association? 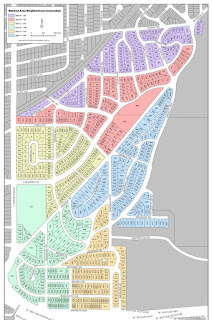 Our area is an unrepresented island, surrounded by previously organized neighborhood associations. The geographical boundaries of our organization will enhance the commonalities we share as neighbors, i.e. Seminole Highway and Yuma Drive traffic patterns, runoff from our area having an impact on Lake Wingra and the Arboretum, and the need for an active Neighborhood Watch. We are creating an organizational structure that will serve as a liaison with other City of Madison entities, should issues affecting the neighborhood arise. The City of Madison has direct access to the Association, and we, in turn, will be apprised of issues that may affect out neighborhood. What is the goal of the Neighborhood Association? Our goal is to keep our neighbors informed in ways we are not able to do at this time. The City of Madison has issued start-up grant money; and proposed bylaws, written by an interim committee, will need approval by the general membership. A geographically representative body will meet regularly to discuss neighborhood feedback, and no one person will play a representative role for the entire neighborhood. What are the advantages provided in forming this organization? We can develop better awareness and access to the services and agencies of City, County and School governments. By developing a website, our neighbors can become more aware of and have access to the services and agencies within these governments. The neighborhood association will provide news for neighbors through a website, newsletters and surveys as issues/concerns arise. The Association will give all of us regular contact and information from our alder and county board member. A general meeting to estaablish the CRMMA will take place in September. You may have known that there is a Nakoma League civic organization that includes part of the CRMMA area. That association is interested more in social events, whereas the new one will focus more on political and environmental matters. This information was provided by Carol Buelow, one of the organizers. We got acquainted with Carol when she worked on the frontage road ceramic tile murals with people from the Dunn’s Marsh Neighborhood. Other organizers are Mary Odell and Norma Hove. As in our case, it’s the women of the neighborhood who are initiating a neighborhood organization. Dane County has been and will continue to be a leader in our efforts to clean up our lakes. The challenges our lakes face today accumulated over decades and there is no cheap, simple, short term fix. Like all of the important work we do, sustained partnerships and a shared will to implement effective solutions will incrementally bring improvement and progress. That progress is worth noting. Over the past five years, Dane County-led efforts - - manure digesters, our storm water grants, and farm by farm conservation practices - - have prevented over 12,000 pounds of phosphorus from entering our local waters. In more tangible terms, one pound of phosphorus is enough to grow 500 pounds of mucky green algae. While miles of buffer strips are being planted separating fields from waterways and other important work happens on a regular basis with our partners in agriculture, innovation offers us incredible opportunity. We are beginning work on a new technology which will turn a brown watery by-product of the manure digestion process into clear potable water and remove 100% of the phosphorus. Our incredibly popular storm water outflow program replaces decades’ old sewer pipes that direct runoff from rains right into our lakes. At the end of 2016, this program will be stopping the flow of over 607,000 pounds, equivalent to 30 dump truck loads of sediment, and over 2,700 pounds of phosphorus from getting into our lakes each year. We will continue to invest in this proven tactic. While it’s imperative we continue to invest in long term solutions to address the sources of phosphorus - the root cause of what challenges our lakes - short-term strategic improvements ensure families can better enjoy these waters while our hard work progresses. That is why we are constructing the County’s first “Clean Beach Corridor.” Open for this summer’s swimming season, this clean corridor sets up a protected, filtered pool of water within Lake Mendota. We must continue our investment, our work and our partnerships to clean our lakes. They are an imperative part of what makes Dane County such a wonderful place to live and visit. Biking is a big part of our quality of life and a way for people to get out and enjoy our lakes and countryside. Just this summer, the League of American Bicyclists has awarded Dane County one of its top awards, recognizing it as one of the top counties for biking. Dane County is one of only seven counties in the entire country to earn this designation. There are over 645 miles of bike lanes and trails in Dane County. Over the past several years, we have invested millions in new off-road trails and efforts to make on-road biking safer. Just this spring we started construction of the Lower Yahara River Trail, a waterfront path that has the longest bike and pedestrian bridge of any project in Wisconsin. This trail will connect Lake Farm county park with McFarland and eventually will wind its way down the Yahara river to Stoughton. Planning will soon get under way on the Glacial Drumlin Trail, and a new North Mendota Trail to help provide safer cycling. A grant program I started in 2011 has awarded $3.2 million in county funds to local municipalities for bike projects. These grants expand bike trail interconnectivity, create destination-oriented regional bike trails, and improve bike safety. Late last year, we opened the Brigham Trail, a hard surface multiuse trail in the Town of Blue Mounds. The off-road trail is approximately 1.5 miles long and extends from the Military Ridge State Trail to Brigham County Park and also includes a connection to the Cave of the Mounds, a National Natural Landmark. We are excited to be recognized for our work to strategically grow and connect Dane County bike trails. While you are enjoying the weather this summer check out our parks department website for up-to-date information on bike trails. author of On Fourth Lake: A Social History of Lake Mendota. Don will host a series of history-themed cruises throughout the summer and fall for Betty Lou Cruises and Madison School & Community Recreation (MSCR). Each trip will offer a unique opportunity to learn more about the people, places, and events that have shaped the shoreline of Lake Mendota, Madison’s greatest lake, as we know it today. On Monday nights at 6:30 p.m., August 29, Don will narrate a Lake Mendota History Cruise, which includes light appetizers and a cash bar, for Betty Lou Cruises (bettyloucruises.com). And on Sundays—August 7 at 5 p.m., and September 25 at 10 a.m.—he will narrate a Social History Celebrity Cruise aboard a MSCR pontoon boat (www.mscr.org <http://www.mscr.org> ). For more information and to make reservations, visit their websites. Don spent over a decade preparing On Fourth Lake. His work combines the personal experiences of people who lived, worked, and played on the lake with the events that shaped Madison, the Badger State, and the nation. The book is richly illustrated with more than 500 maps, newspaper articles, and photographs. Many of the images were sourced from private collections and have never before been available to the public. This book will prove fascinating to anyone who spends time on Lake Mendota or has an interest in the history of Madison and Dane County. On Fourth Lake is available at area bookstores, museum stores, gift shops, and other retail outlets, as well as on amazon.com. Visit the book’s website at www.LakeMendotaHistory.com <http://www.LakeMendotaHistory.com> for a complete list of retail outlets and upcoming author events. 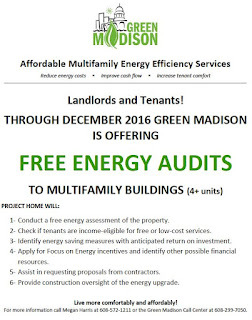 The sun is shining on Madison this summer, and the City’s MadiSUN program wants to help residents reap the benefits. Mayor Paul Soglin and the City of Madison have launched two new programs that make it easier and cheaper for local homeowners to install rooftop solar electric systems. The MadiSUN solar group buy program is designed to simplify the process and reduce the costs of installing solar systems through a group purchase approach. Dozens of local families will go through the installation process at the same time, working with a pre-qualified installer that has been thoroughly vetted and can guarantee a competitive price. The Group Buy program is recruiting interested households from now through September 16. Interested participants can learn more and sign up at www.madisunsolar.com <http://www.madisunsolar.com> . Elmore and his family helped launch the 2016 program at a press conference with Mayor Paul Soglin. “We saved a lot of money, and we continue to save money,” Elmore added. MadiSUN will also offer a new Solar Energy Loan, in partnership with Summit Credit Union, to provide low-cost financing for residents who want to install solar. Madison households can borrow up to 100% of the installed cost of a solar energy system at a highly competitive fixed rate, with no collateral, no fees and flexible repayment terms. The maximum loan amount per household is $20,000. MadiSUN’s new initiatives will add value to the state and federal incentives already in place. These include a 30% federal tax credit in place through 2019, as well as Focus on Energy solar rebates up to $2,400 for residential customers. Demand for solar rebates typically picks up strength at this time of year, and funds could be exhausted before long. As of mid-June, there will be no more funding for Focus on Energy solar rebates after this current year. RENEW Wisconsin, a local nonprofit organization working to grow renewable energy statewide, will administer the program on behalf of the city. Community partners such as Sustain Dane, the Wisconsin Council of Churches and Madison’s neighborhood associations will help spread the word. “We are really grateful for the cooperation of neighborhood leaders and homeowners,” Mayor Soglin said. Interested households have several opportunities to learn more about the program. MadiSUN will host Information Sessions across the city to help residents determine whether their home might be a good fit for solar and to educate residents about participating in the group buy or solar loan programs. To learn more or sign up, please visit www.madisunsolar.com <http://www.madisunsolar.com> . To learn more or sign up, please visit www.madisunsolar.com <http://www.madisunsolar.com> . 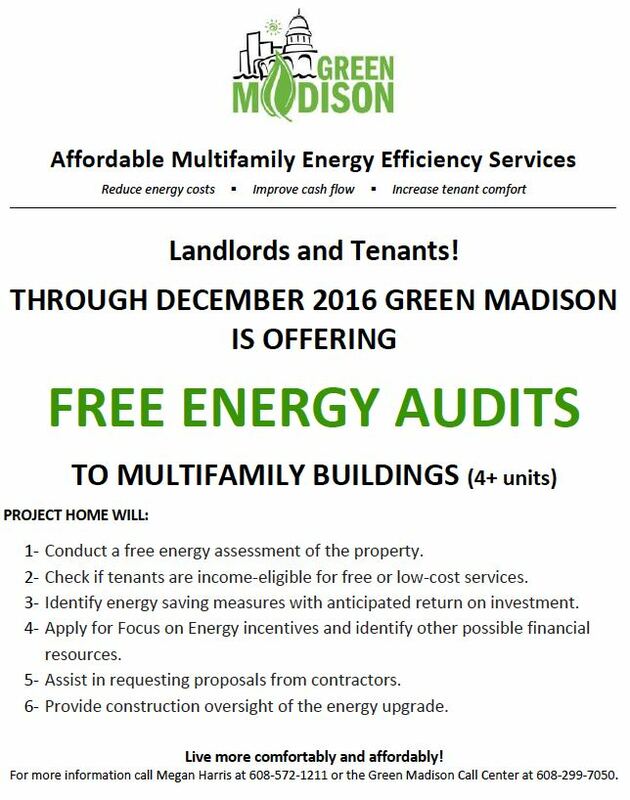 Please RSVP for Madison workshops by emailing Katherine@renewwisconsin.org or call 608.255.4044 x5. Landlords and tenants of buildings with 4 or more units, take a look at how Project Home can conduct a free energy assessment of the property, check if tenants are income-eligible for free or low-cost services, and more. Wisconsin Master Naturalist classes are finally available in this area! The Empire Sauk Chapter of TPE is offering this incredible training course in August and September. You won't want to miss this exciting opportunity! The Wisconsin Master Naturalist (WIMN) Volunteer Training Course is a 40-hour series of classes and field trips. The course curriculum is set by the WIMN Statewide Office and covers these topics: geology, ecology, plant communities, wildlife, interpretation, water, water life, and human impacts. Course materials, provided by the Statewide Office, present a consistent, statewide perspective on Wisconsin's natural resources, ecological processes, and conservation issues. Any adult who is curious about nature, enjoys learning, and wants to work on behalf of conservation efforts in his/her community, can become a WIMN volunteer. The Prairie Enthusiasts (TPE) is hosting a field based course at Mounds View Grasslands, a 530 acre property owned by TPE south of Blue Mounds. Our instructors are chapter members and volunteers, Patricia Trochlell and Rachel Potter. Pat is a wetland biologist with Wisconsin DNR and a volunteer site steward for TPE’s Parrish Savanna. Rachel is a retired Madison school teacher with a lifelong passion for natural history. [Editor’s note: Rachel lives in the Dunn’s Marsh Neighborhood and was on the Dunn’s Marsh Council for a time.] Both of these volunteers are excited about experiential environmental education and field-based learning. Our indoor classroom will be the rustic Schurch-Thomson barn. In September, this working barn is a center for prairie seed collection and processing as seed is prepared for planting. The class will meet every other weekend rain or shine, starting Saturday, August 27 (10 am-6 pm) and Sunday, August 28 (11 am-4 pm) and ending on Sunday October 2. Consider taking advantage of this incredible opportunity. Class room is limited, so sign up soon if you're interested. Enjoy this beautiful summer weather! The house on Milford Road right next to Marlborough Park was vacant for well over a year, and all went well - no vandalism, no thefts. But no sooner than the new owner started working on it this summer, than windows were broken on 3 different occasions. This was maddening - and expensive - to the owner, and a black spot on the neighborhood’s reputation. It was a trail camera that first caught images of the middle-school-aged boys who did the damage. Another day it was their excited voices and a thunk against the house that brought a neighbor with a hand-held camera to get even clearer pictures. The photos were posted on Facebook. It was the Facebook posting that prompted 2 different neighbors to respond with information that identified the boys. One neighbor even had the full name and address of one boy. The other said she knew 2 of the other 3 boys. She said they were “good boys,” and she would talk to their parents. The ID information was shared privately. But the Facebook posting also brought brought on a fierce neighborhood debate. Should parents be talked to first, or the police called? Is it safe to talk to parents, especially if you don’t already know them? What’s best for the kids? What will make the vandalism stop? Here are some sample responses. “Somebody, please find their mothers, and don’t step in when they receive their reward for their hard work,” said one. This writer recalled the time she had been caught using eggs and toilet paper on a house. She said she “got the worst punishment of her life for doing this” and would rather have called the police on herself instead of getting the consequences her parents meted out. But all this discussion about contacting parents was a moot point in the incident on Milford Road in 2016. These boys were not known, and the police had already been called when the third vandalism was in progress and there was a chance of catching the window-breakers in Marlborough Park. Well, what to do now that the boys had probably been identified? One person suggested paying the boys to watch over the property. What!!!? Reward them for their vandalism??? was the one person’s response to that. “Every youth who receives a municipal ticket from MPD ages 12 to 16 qualifies for RJ instead of court. In RJ, they are held accountable, have to talk about why they did what they did and what they can do now to repair the harm and become connected to the community. The program is free, but the youth must agree to do RJ instead of court (they must agree to take responsibility and work to heal the harm). RJ also works to support the youth, to get to the root causes / reasons behind their actions. So, in the end, what has happened? In the case of the boy who was first identified, the investigating officer Luke Lengfeld reported that he talked to the boy’s parents and that he gave no citation or restorative justice consequence. I think this was the boy who was not actually involved in throwing objects at the house and was just tailing along with the others on the last day. The two boys known by the second person reported that one boy’s father asked to talk to the owner and the camera-wielder. That happened, and the boy talked to both adults as well. The father said there would be strict consequences. Presumably the parent of the third boy took care of consequences for him. We don’t know that for certain. No one knows about whether the fourth boy’s parents learned about his involvement in the window-breaking. According to the property owner, the police seem to have dropped the ball after talking to the parents of the first boy. The owner says the police never followed up with him after he got the names of 3 of the boys even though he made several attempts to touch base with the officer. Recently we learned that our Madison Neighborhood Police Officer is Mike Mawhinney. He serves the Madison area of the neighborhood including the Seminole Highway side of the n’hood and the Allied Drive side. Want to talk to him about neighborhood issues? Just give him a call on his cell phone at 444-8715. He works 6 days on and 3 days off, 3 pm-11 pm. You may also call dispatch at 255-2345 to find out if he is working before you try to call him. DMNA Neighborhood Council members met him at the May Council meeting where he gave us insight into the murder at the BP station on May 10 and the two other related shootings. He also attended the June 9 meeting at our request. We will be inviting Mike Mawhinney and the Allied area neighborhood officers to our annual picnic on August 5. Frozen for a moment in time, the man and she locked eyes. Then he took off running down Britta. They were safe. The time was probably just before 6:25 pm on Tuesday, May 10. They had been headed out to the Verona frontage road to get gas before taking her granddaughter to a class. “Which gas station?” her daughter asked. They chose the Mobil, the station that has an entrance off Britta. It was only as she was making her payment that she discovered what the previous frightening experience meant. A bunch of people came running into the station from across Britta yelling about what they had just witnessed, the shooting at BP that took the life of Darius Haynes. For others, just a bit later, the first clue of things gone wrong was the flashing lights of a police car parked across the Beltline frontage road near Whenona Drive, more of a curiosity than anything else. And then, from the vantage point of this writer who took refuge in the closest neighbor’s house, looking out the front window, it was seeing 3 police officers up on the hill in front of Prairie UU Society, one with a long gun at ready, another holding a German shepherd. The police and even an US agent from the US Department of Justice’s Bureau of Alcohol, Tobacco, Firearms & Explosives (ATF) remained in the neighborhood until around 11 pm, going door-to-door interviewing residents and hunting in the street and in backyards for a possible discarded weapon. By now we all know the story of what happened at the BP. Someone with a grudge decided to kill his “enemy” and shot Darius Haynes as he was sitting in his car at the BP. It was a cold-blooded assassination. Worse yet, on Wednesday, May 11, it was the same thing all over again at the Petrol station further down the Beltline on Rimrock Road. The families, the neighborhoods, and the police are left with the aftermath: grief, anger, fear, and everyone trying to understand what happened, trying to figure out how to keep such things from happening again. In the aftershocks from the shooting at the BP station on the Verona frontage road, neighborhood people, organizations, and politicians are searching for what to do. On Thursday, May 12, 2 days after the shooting, 2 demonstrations were held at the BP station. At 9:30 am, a group of over 20 people participated in a silent march from the parking lot of the defunct Walgreens drug store to the station. Later, early in the evening, a larger group of people, including many young people, held a vigil at the BP. Now at the end of July, the memorial to Mr. Haynes still circles a young sapling in front of the BP. Also, on Thursday eveing, May 12, the Dunn’s Marsh Neighborhood Association invited our neighborhood police officer, Mike Mawhinney, and the owner of the BP station, Ravi Singh, to its monthly Council meeting to learn more about the tragedy and to discuss possible responses. The next Monday, Michael Johnson, CEO of the Boys and Girls Club, issued a 15-point list of suggestions for working to prevent violence. Tuesday, May 17, our 10th District Alder Maurice Cheeks and Alder Phair, who represents the Meadowood neighborhood, held a press conference on the steps of the City County Building to present their plans for Madison City Council action. Signs carried by the two leaders of the May 12 silent march said, “STOP the violence. Our communities needs our father’s & Sons” and “STOP the violence. Put the guns down! Your Lives Matter!” The group was multi-cultural: Black people, White people, at least one Muslim. Represented at the march were several organized groups in the neighborhood: the Dunn’s Marsh Neighborhood Association (DMNA) , the Allied-Dunn’s Marsh Neighborhood Association (ADMNA), Mothers in the Neighborhood, Prairie Unitarian Universalist Association, the Allied Community Co-op (ACC), and possibly others. Dunn’s Marsh Neighborhood Council members attending were Elvice McAlpine, Shonita Skinner, Mary Mullen, and Sina Davis. Others connected to the DMNA who marched were Patty Stockdale and Joann Kelley. Both co-presidents of the Allied-Dunn’s Marsh Neighborhood Association were there - Katy Farrens and Alice Howard - as well as Madison Alder Maurice Cheeks and Fitchburg Alder/County Supervisor Dorothy Krause. These and others present wore hats - actually t-shirts - related to more than one of the organizations mentioned in the previous paragraph. Most attendees signed a roster of people wanting to be involved in conversations to prevent gun violence. Afterward, Alder Dorothy Krause, ACC Chair Cassandra Sonko, and DMNA President Mary Mullen stopped in at the BP to invite the owner to the DMNA Council Meeting that evening. Dorothy and Mary then walked over to Avalon Village on Atticus Way to talk to the manager Danielle Reuter. Dorothy suggested that the Gorman Company might want to pair up with Fast Forward to provide roller skating there at a discount for Avalon Village tenants. For her part, Manager Reuter talked about some of the ways she helps tenants understand their responsibilities as renters. The press conference downtownon May 17 was attended by several people with connections to the Dunn’s Marsh neighborhood including Cassandra Sonko (Allied Community Coop); Sina Davis (Mothers in the Neighborhood and Dunn’s Marsh Neighborhood Association); Faith Chovin, Mary Mullen (DMNA Council members); and Patty Stockdale. 1. Meet with the leaders associated with these incidents and offer them gainful employment and training opportunities to help them become productive adults in return for cease fire. If they don’t comply offer them a ticket out of town or place additional scrutiny on them and their comrades from all levels of government and law enforcement. 2. Implement a city-wide Madison Alternative Policing Strategy (MAPS). A program that’s led by community leaders working with the police department with a full-time executive director, support staff with an independent board that works with police officers, civic leaders and community organizers in each district to address violence prevention strategies. This should be a non government function led and governed by representatives from the community. 3. Offer a $10k reward for any homicide that is reported and leads to the arrest and conviction of any offender(s). 4. Twice a year organize a citywide gun back program in partnership with communities of faith and offer $250 for any working handgun and $500 for any working semi automatic weapon(s) turned into authorities. In addition, offer free gun locks at every public library and community center. This strategy could prevent children and stolen guns from being used inappropriately. State Representative Melissa Sargent have offered a resolution to address this statewide. 5. Create a targeted intervention program for young men 18-40 who are former gang members or non-violent offenders and help them find life and career coaches to minimize them from committing another crime in our community. 6. Hire former gang members as outreach workers who have street credibility but also have demonstrated that they have become productive adults. These folks could become a bridge between law enforcement officials and emerging individuals who are considering a life of criminal activity. 7. Offer immediate assistance, protection and support to any person and their family who is willing to cooperate with police to help bring intelligence that can solve crime(s) in our community. A fund could be created to help cover this cost to assist law enforcement officials. 8. Ensure high quality, culturally competent mental health services that are widely accessible. While gun ownership has been rising, mental health services across our region have been woefully underfunded. 9. Support a comprehensive violence prevention plan that include prevention, intervention, enforcement, rehabilitation and reentry programs. A growing research base demonstrates that it’s possible to prevent shootings, killings and violence in the long term. Yet our communities lack the resources and a coordinated effort to do what is needed. 10. Fund grassroot, community outreach workers to work with neighborhood associations and community centers in targeted communities. The plan should also call for all community centers to stay open until 10pm during the week, midnight on Saturdays with some programming on Sunday for at risk teens and young adults. 11. Offer universal school-based programs to reduce or prevent violent behavior in a given school and develop supportive strategies to reduce school suspensions across the board. 12. Lobby for policies that address social determinants of violence. Interpersonal violence is strongly associated with macro-level social factors as unemployment, income inequality, rapid social change and access to education. A comprehensive violence prevention strategy must be directed at the aforementioned factors to reduce the inequities which fuel interpersonal violence. 13. Implement a county wide reentry court program that allows young non violent offenders who qualify to learn a trade — from plumbing to welding to culinary arts. It also provides them with hours of classes on anger management and communication. 14. Treatment for substance abuse. About 75% of inmates need substance abuse treatment, but only about 17% are receiving it. Research shows that correctional substance abuse treatment reduces recidivism. 15. Teach young children (and their parents) EFFECTIVE CONFLICT RESOLUTION SKILLS EARLY. If children only see unhealthy conflict resolution in the home, at school, on social media, on the streets, and in the community…they will be more inclined to use violence to solve issues in their young lives. Madison actually has a concrete chance of turning these issues around if we make it a priority and stop announcing isolated initiatives that give false hope with limited to no resources aligned to these announcements. We are better than this and I hope our city does not become numb to these kinds of incidents. These strategies might save someone’s life, including yours. Meeting tonight with the grassroots community leaders who were instrumental in working with the mayor and city council on the 15 point violence prevention plan. Now that there is a commitment to fund the plan the group is meeting to talk strategy and implementation. I am honored to serve as their advisor. On May 17, Madison Alders Maurice Cheeks and Matt Phair unveiled a plan for tackling youth violence in Madison. While they had been working together on this for some time, the recent shooting murders at 3 locations along the Beltline, including the one the the BP station in our neighborhood, brought them to hold a press conference on the steps of the City County Building. Both alders made introductory remarks, followed by emotional questions, comments, and responses from the small crowd of interested people who had gathered to learn about the proposals. These proposals will become part of the City budget process that is just beginning. The first is to continue to expand our youth employment initiative. Like last year, Alder Cheeks and I will propose to add funding so 115 more youth will have employment opportunities. We also call on staff and our agency partners to develop a continuum of care model that creates efficiencies in the system and serves youth of all employability skills. Second, to implement something we’re calling the Madison Peace Project. Based on a similar program in Milwaukee this initiative would invite Madison youth to develop plans to reduce youth crime and violence in their neighborhoods and submit their proposals to the City for competition. The winning proposals will be implemented by the City and be rewarded with high visibility prizes. Third, with a 2016 budget amendment fully fund the Communities Against Violence Program for the rest of this fiscal year and annualize it starting in 2017. This cooperative effort of the Madison Police Department and non-profit agencies is an evidence-based initiative that if wholly funded, changes the lives of some of Madison’s most violent criminals and makes our community safer. Fourth, add youth mentoring as a priority in the City’s community services funding process. Research shows that youth mentoring programs are an effective tool to prevent youth gun violence and other problematic behaviors. In addition to specifying it as a funding priority, we are calling on the Madison Out of School Time initiative (known as MOST) to include youth mentorship opportunities as part of its online program locator. This will help parents and advocates easily find all of the many opportunities that currently exist for youth mentorship. Fifth, accept the Dane County Criminal Justice Work Group’s recommendation to create a community based crisis restoration center and ask the Mayor, County Executive, as well as Council and County Board leadership to from a taskforce to begin an implementation strategy and community engagement process that will make Madison one of the first cities in the country to build a facility that intentionally diverts people from the criminal justice system and into care and treatment that so many of our residents need. 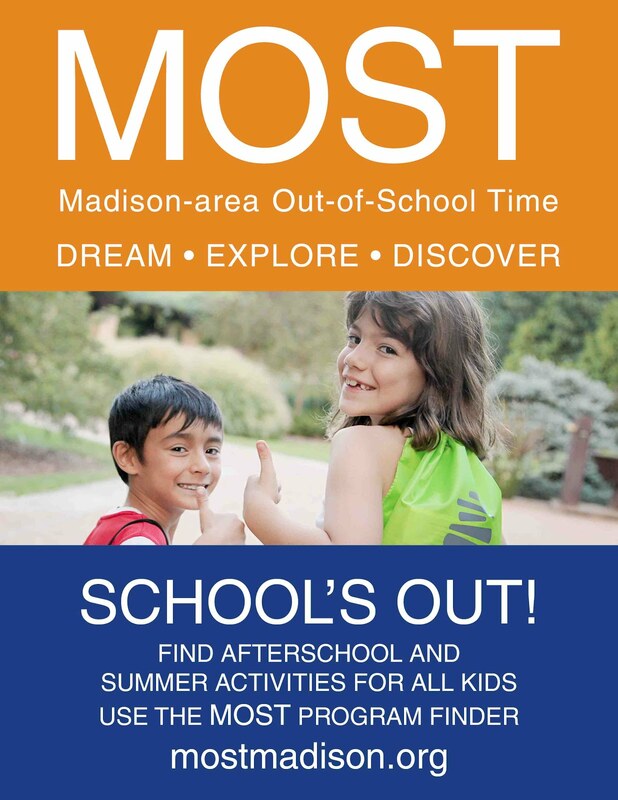 Finally, expedite the City and School District’s joint Madison Out of School Time (MOST) initiative goal that states all Madison kids should have access to high-quality out-of-school-time programming. After the formal remarks by the alders, the press and public were invited to ask questions. That opened the floor for puzzled questions and impassioned comments. Since the emphasis was on youth violence, several people had related remarks. Patty Stockdale noted that the recent shootings involved men in their later 20s and 30s, not technically youth anymore. How would these proposals prevent violence of this older group of offenders? Cassandra Sonko voiced her opinon that violence prevention needs to start in the very early years, even before kindergarten. Another speaker suggested that young Black men are lacking positive role models: the “heroes” of the day for kids are men who live by violence and that’s what boys and young men are emulating. Sina Davis suggested that police need to interact in a positive way with the “guys on the corner,” to get to know them as people, not just look at them and treat them as criminals. Faith Cholvin railed at the millions of dollars in TIF funds that are being spent downtown, money that could curb violence if the money were spent on providing mental health programs for those who are troubled and at risk of becoming violent. That brought a hail of approbation from the assembled citizens. To “amens” from the crowd, another person spoke about how jobs have to be available and offered to the those in need of them. On a slightly different angle, a woman who now works with Alder Phair on Meadowood Community Center programs said that Madisonians need to accept that people moving here from Chicago have come for a better life in Madison. Instead of treating new residents from Illinois as outsiders, we need to accept them for their dreams. Doing otherwise immediately makes the newcomers feel rejected. Welcoming them for their motivation is a first step in preventing violence. She asked us to think about how many of us came here from someplace else. That made me think of our own Dunn’s Marsh Neighborhood Council: about half of our Council is made up of people with roots in the Chicago area. Keep tuned for further information on how the proposals fare. I appreciate Chief Koval, DA Ozanne, elected officials, Attorney Edari and community leaders for working together to start the healing process in our community and making this decision today. Ms. Laird has accepted responsibility for her actions, and the victims at the East Town Mall, including the police officers, supported the DA's decision, and I support it as well. I also want to note, that many of our police officers are great people and we should never generalize all police officers for the actions of some. If a law enforcement officer place you under arrest, DO NOT resist, swallow your pride and live another day to tell your story, especially if you are mistreated. There are great opportunities out there for you and don't allow one incident with law enforcement to derail you from your dreams. I have read some of the comments on social media and the news outlets regarding this incident and many of you have communicated so much hate and division towards on another that the actions further divide tears us part. Please show better empathy and be willing to be understand instead of being understood. Many of you all were very vocal and helpful while some of you were quiet. However, many of you stood silent and did not say a word and leadership means sometimes being uncomfortable and many of you chose to stay in an very comfortable place and if we are going to improve the condition of our community, it's time for all of us to be uncomfortable. At least 2 Dunn’s Marsh neighbors have put out rainbow flags in response to the mass shooting in a gay nightclub in Orlando, Florida.